Swirling, dirty clouds reflecting muddy waters rushing below, humid with a high of 60F and rain hammering away the afternoon. 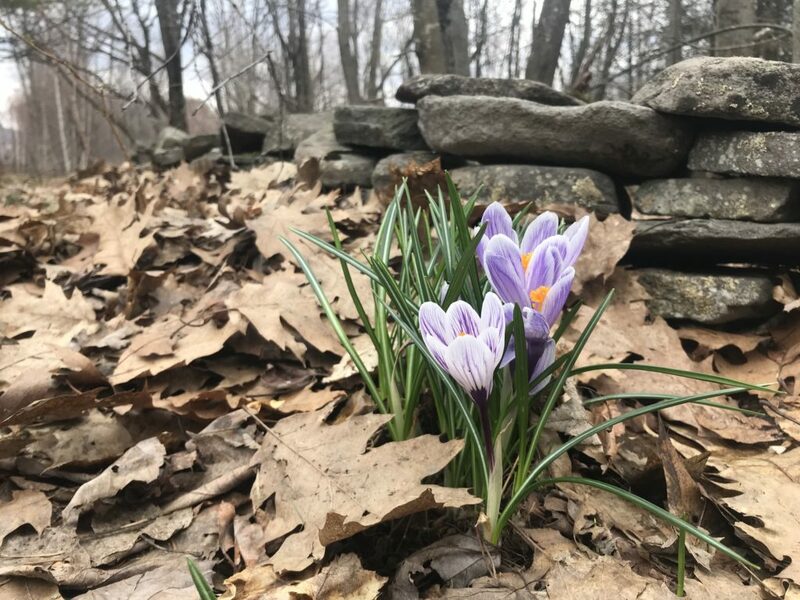 This entry was posted in Daily Catskills on April 22, 2019 by JNUrbanski. A gorgeous balmy, breezy 60F night spills over into the day but draws foggy, blue cloud cover like curtains rippling over gusty winds and a high of 70F. Flowers bloom. Buds bud. Spring is in the air. Update: Warm afternoon rain continues all night until the following afternoon. 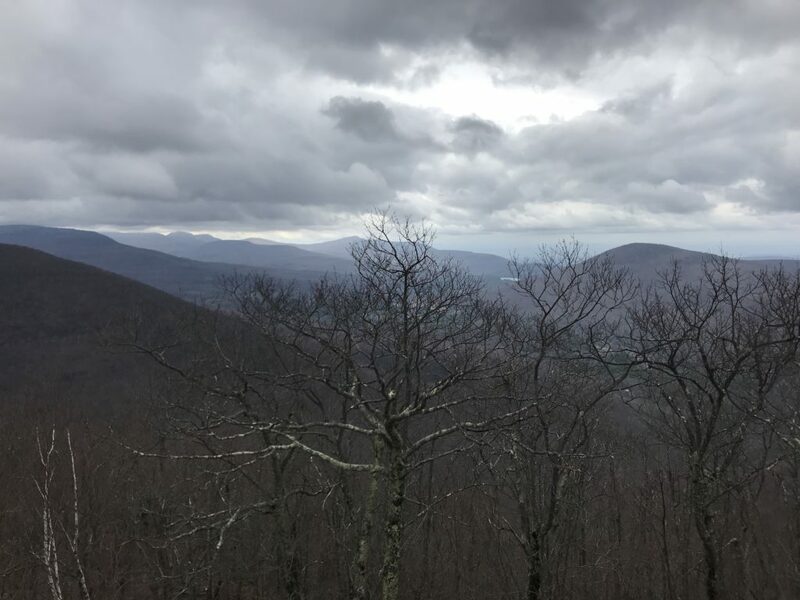 This entry was posted in Daily Catskills on April 19, 2019 by JNUrbanski. 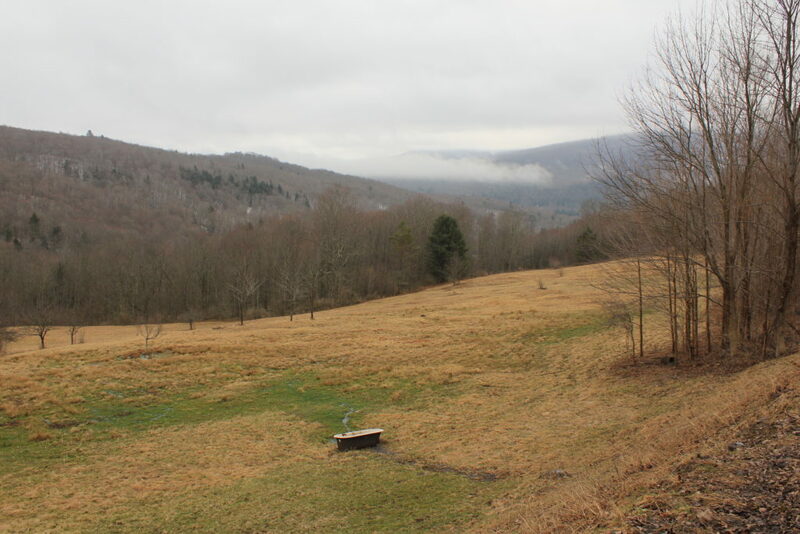 A high of almost 60F, with fog rolling through the valleys and dissolving in the afternoon sun. 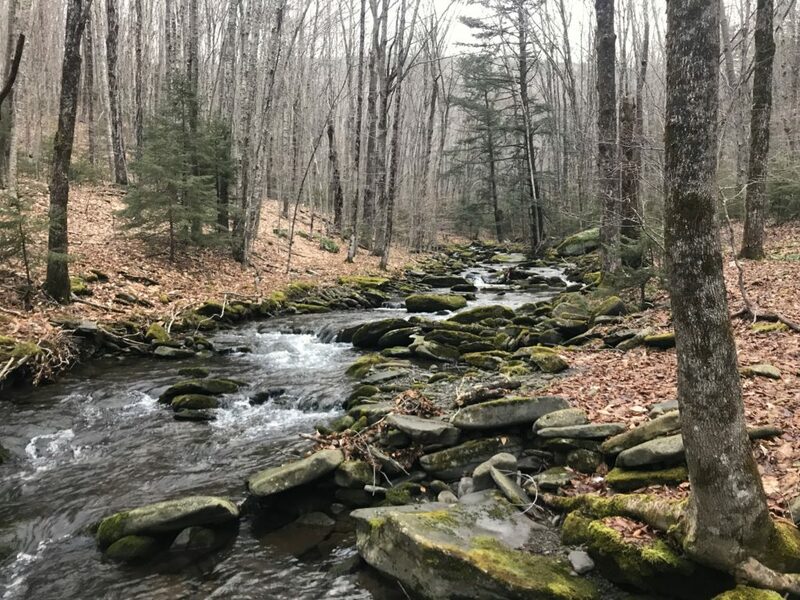 This entry was posted in Daily Catskills and tagged Catskills, Daily Catskills, Upstate, Upstate New York on April 9, 2019 by JNUrbanski. 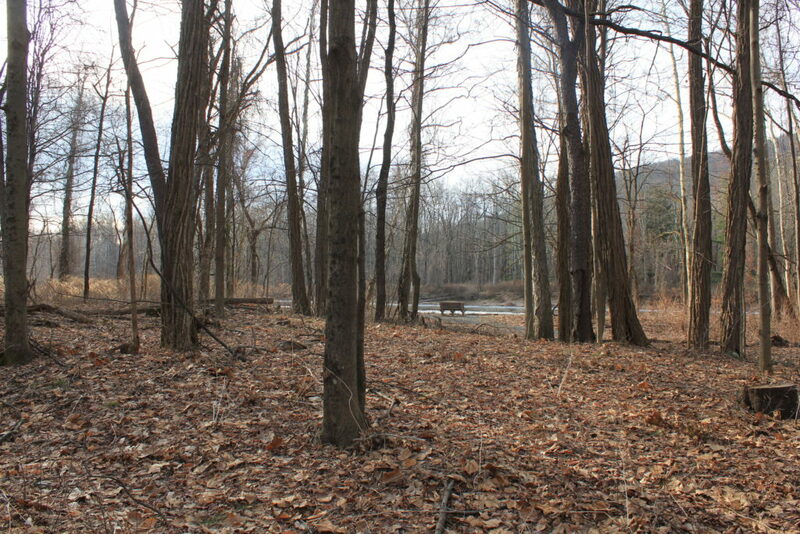 A balmy spring day: a high of 53F with the snow withdrawing into the shadows like a retreating tide. Rivers warm up and run higher. 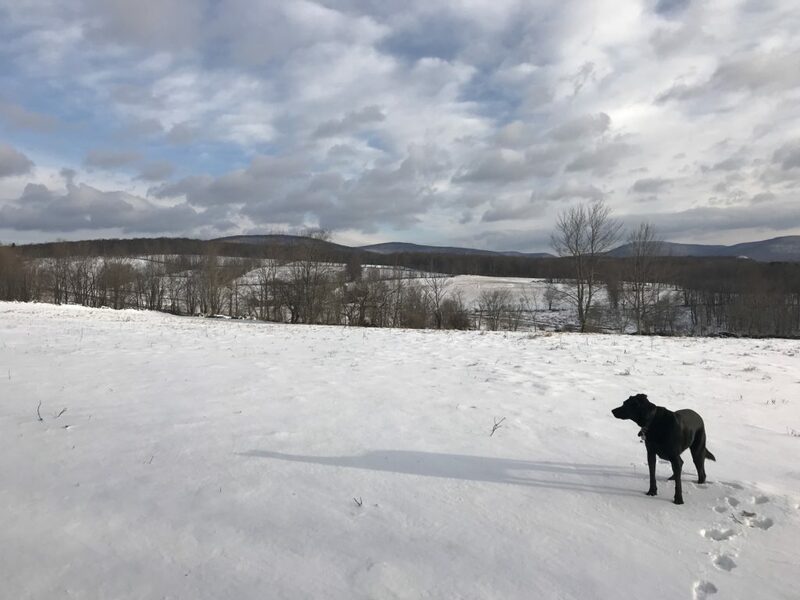 This entry was posted in Daily Catskills and tagged Catskills, Daily Catskills, Upstate New York on March 28, 2019 by JNUrbanski. 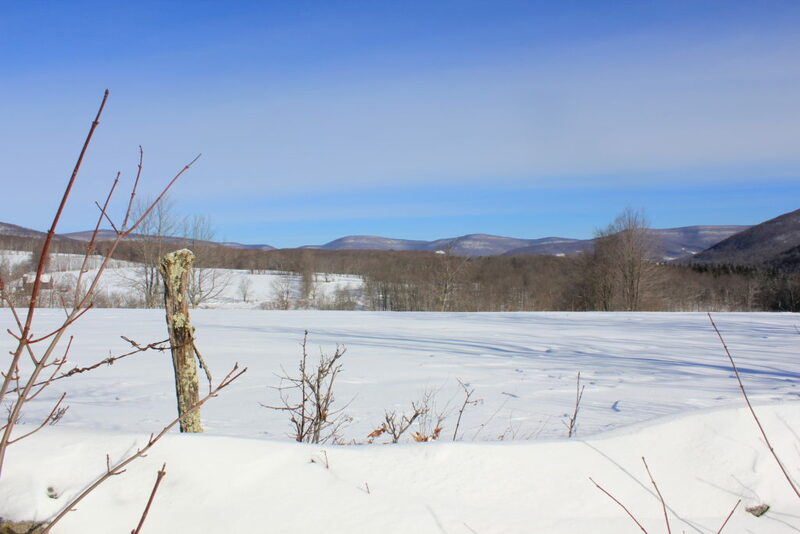 A high of 47F with snow slowly receding in the sun and a veil of woolly clouds. Maple syrup season in full flow. 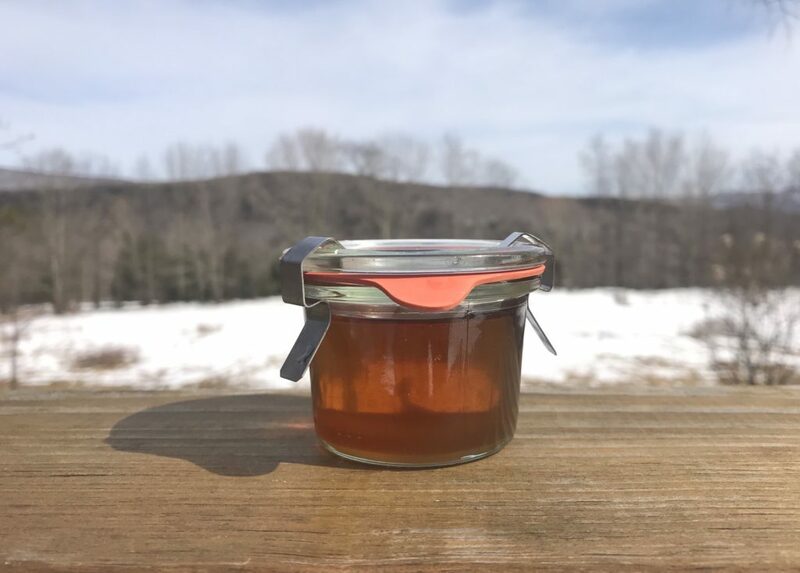 This entry was posted in Daily Catskills and tagged Catskills, Catskills Maple Syrup, New York on March 27, 2019 by JNUrbanski. A high of 50F and clear skies. 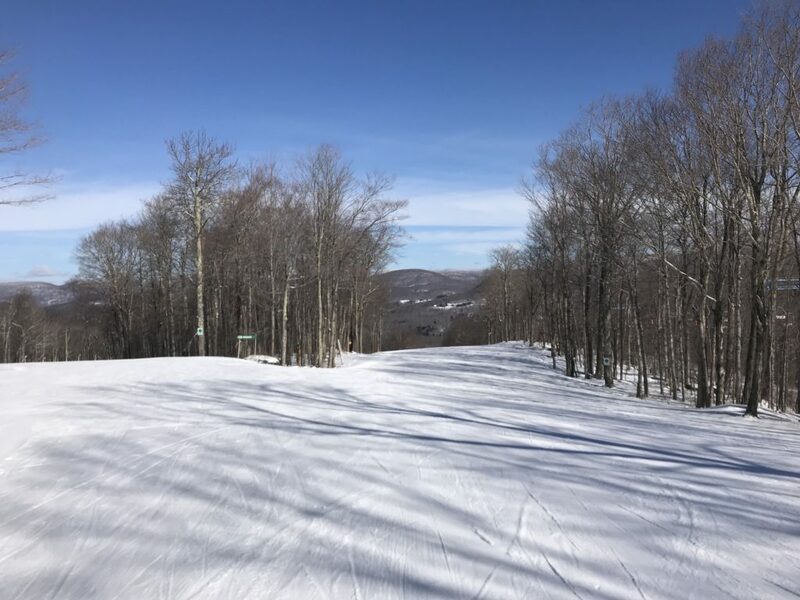 Perfect lunchtime skiing on Belleayre Mountain. Almost a foot of overnight snow descends, putting an end to exactly a week of thatched, nascent landscape and its rich earth tones. Sticky snow like spray foam clings to trunks, boughs and branches, turning outdoor furniture into ghosts, making ski-runs deep and slow. Mountains shrouded in foggy snow clouds. More snow fall during the day and a high of 38F. 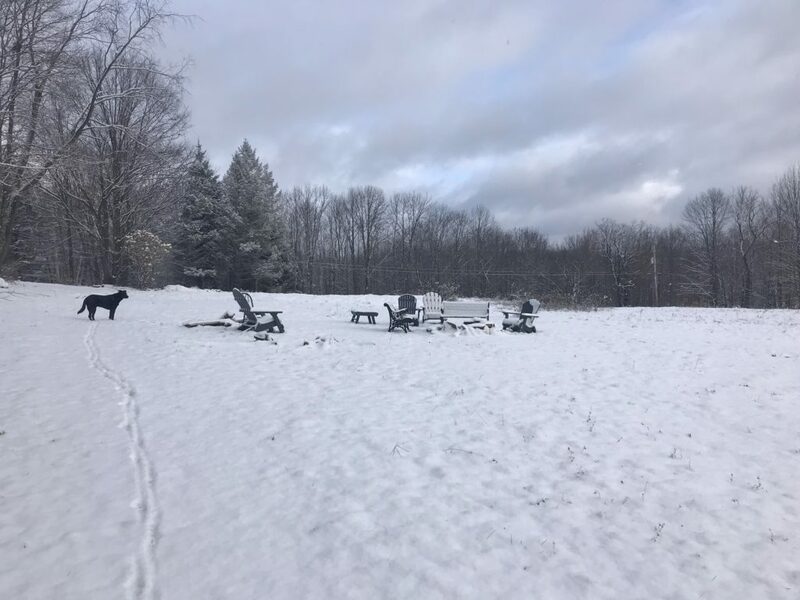 This entry was posted in Daily Catskills and tagged Catskills, Daily Catskills, Upstate New York on March 22, 2019 by JNUrbanski. 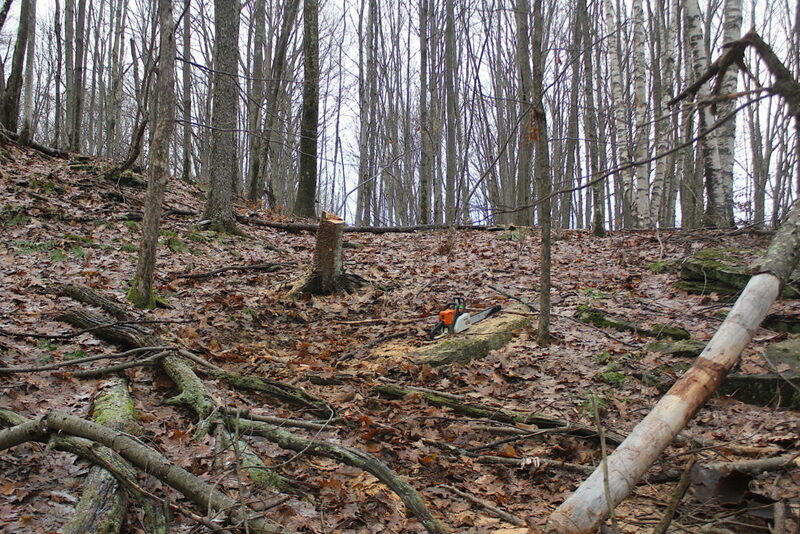 A week of bare landscape reveals woodland activity. Overcast with a high of 40F. 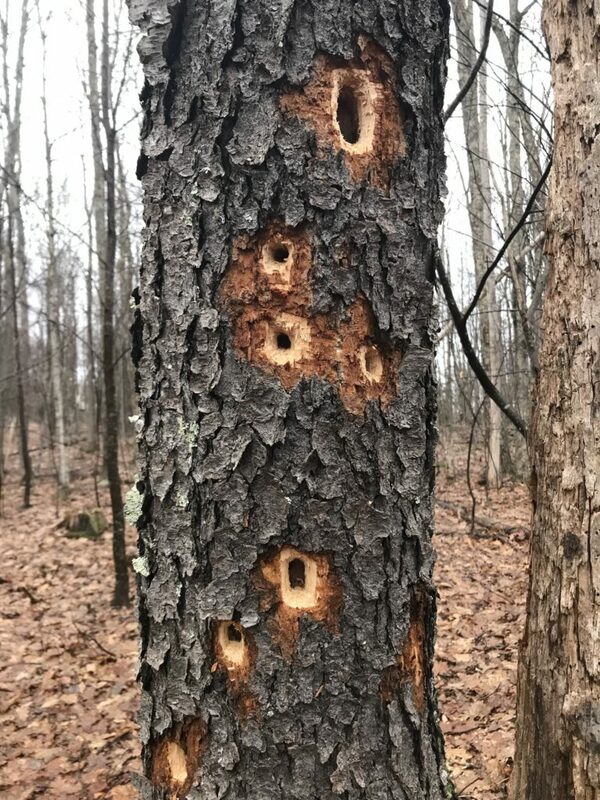 This entry was posted in Daily Catskills and tagged Catskills, Upstate New York on March 22, 2019 by JNUrbanski. Bitterly cold for a high of 18F and an icy wind. Rivers flowing under a crust of ice. 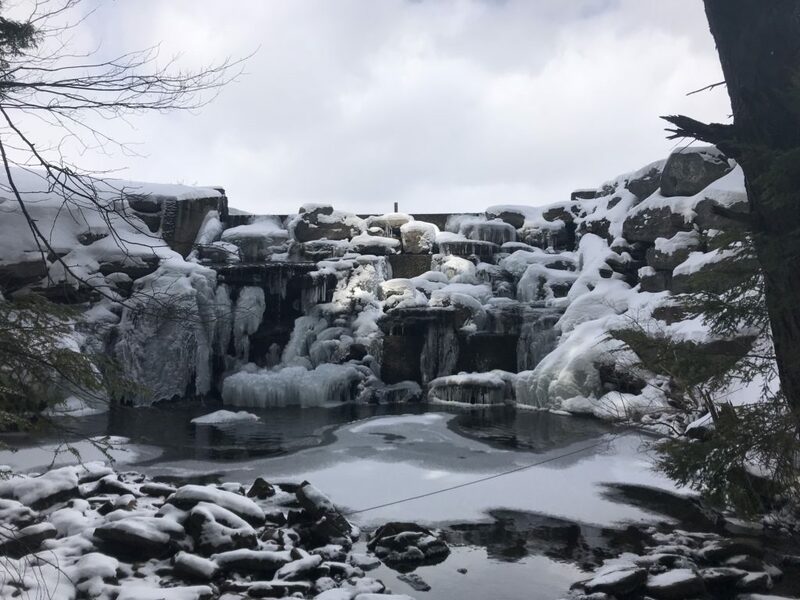 Waterfalls frozen over. Swirling cotton-candy clouds and a brief hint of sun at noon. 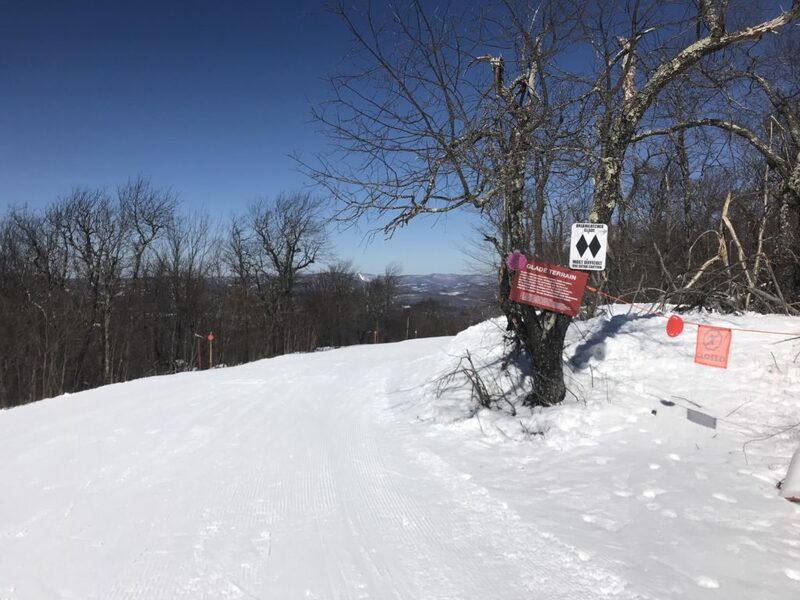 This entry was posted in Daily Catskills on March 7, 2019 by JNUrbanski. 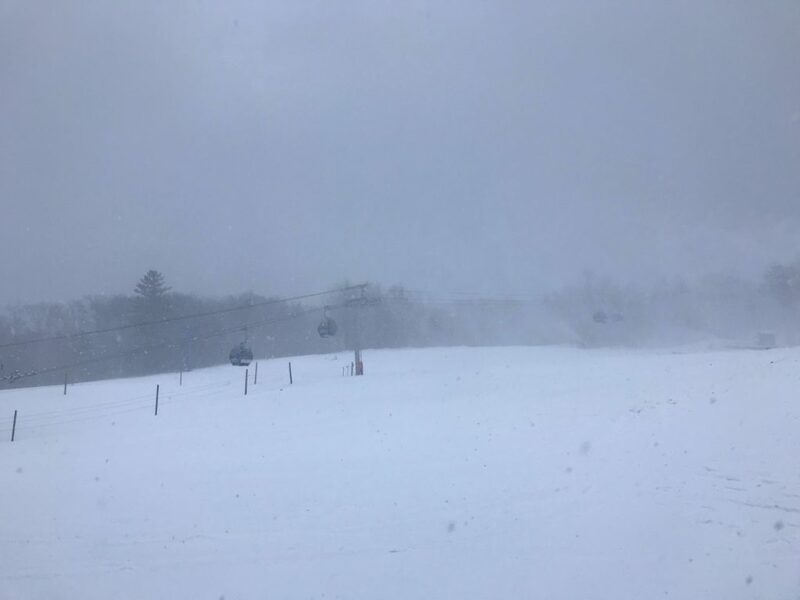 More face-freezing on the peaks: 17F for most of the day with a bitter wind pushing skiers around on the slopes. Some sunshine peeking through the clouds. 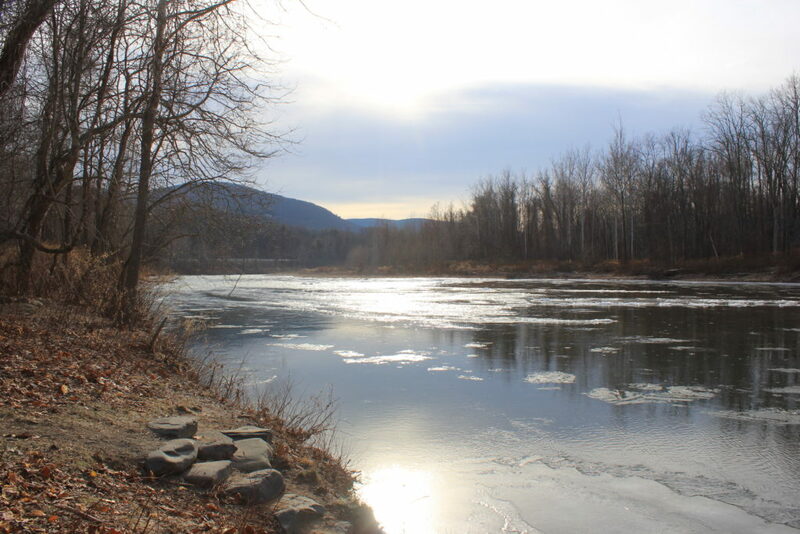 This entry was posted in Daily Catskills on February 26, 2019 by JNUrbanski. Strong squalls whip up the dusty top layer of snow into small, swirling tornados that race across the frozen fields. A high of barely 30F, while most of the day sinks into the depths of frigidity somewhere around 20F. 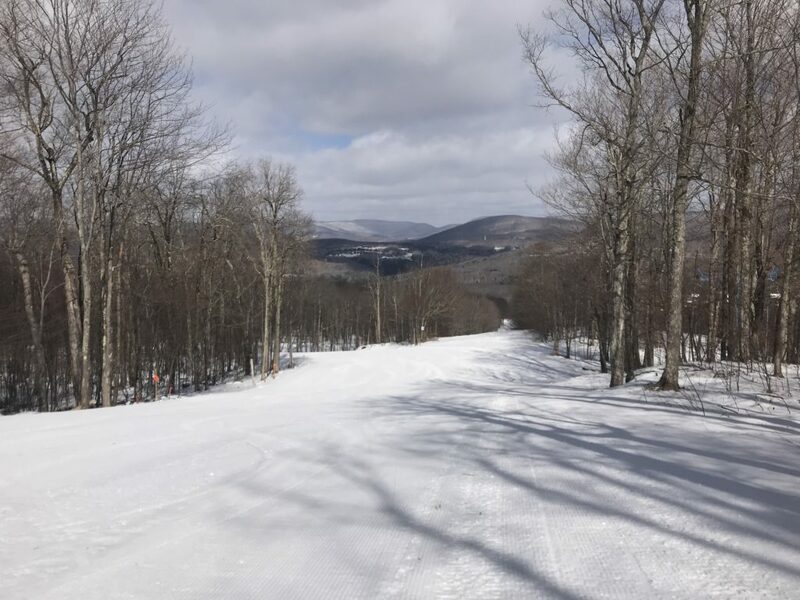 This entry was posted in Daily Catskills on February 25, 2019 by JNUrbanski. Perfect powder on the ski-mountains shrouded in swirling snowy clouds and low-hanging mist. Late afternoon snow and a high of 25F. 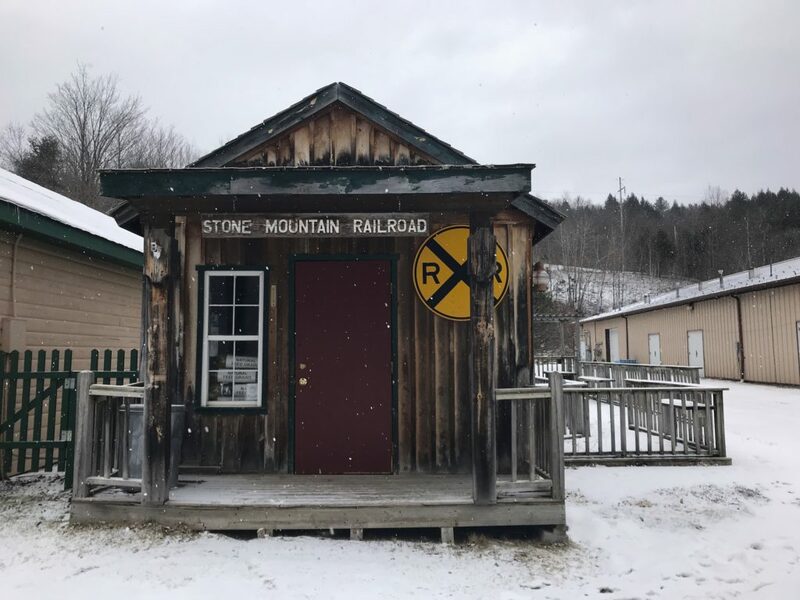 This entry was posted in Daily Catskills and tagged Daily Catskills, Upstate Dispatch, Upstate New York on February 20, 2019 by JNUrbanski. Face-numbing 12F at 8am rising to 27F by mid-afternoon. 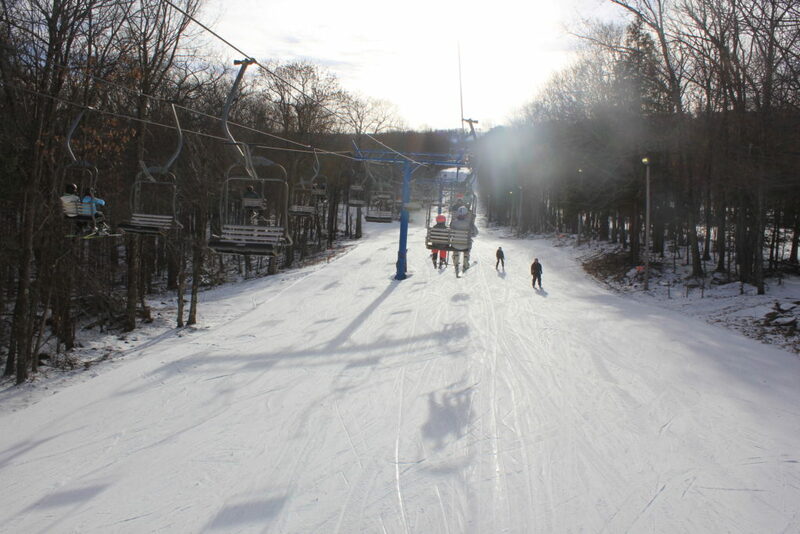 Bright sunshine and fresh powder on the slopes after yesterday’s all-day snow. 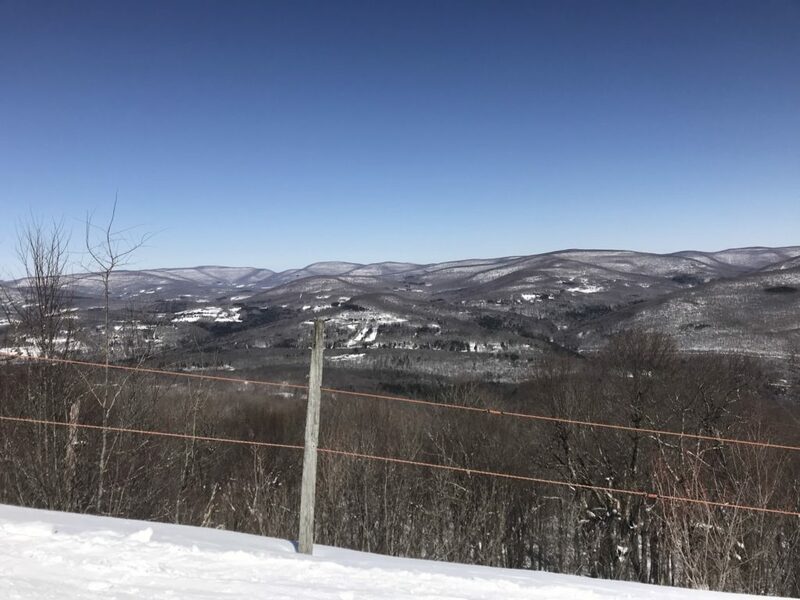 This entry was posted in Daily Catskills on February 19, 2019 by JNUrbanski. 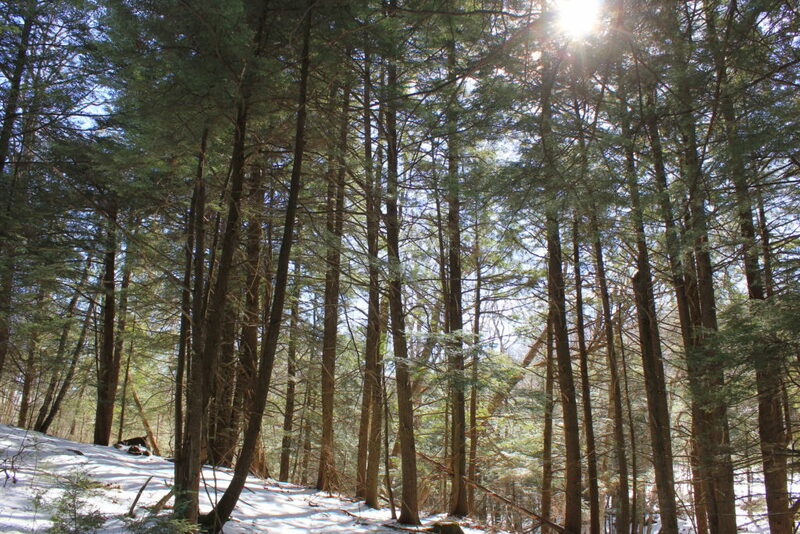 Shards of sunlight search the forest floor beneath the hemlocks. Creeks and rivers are still high, rising to meet the snowy banks. A high of 34F takes the edge off the morning chill. 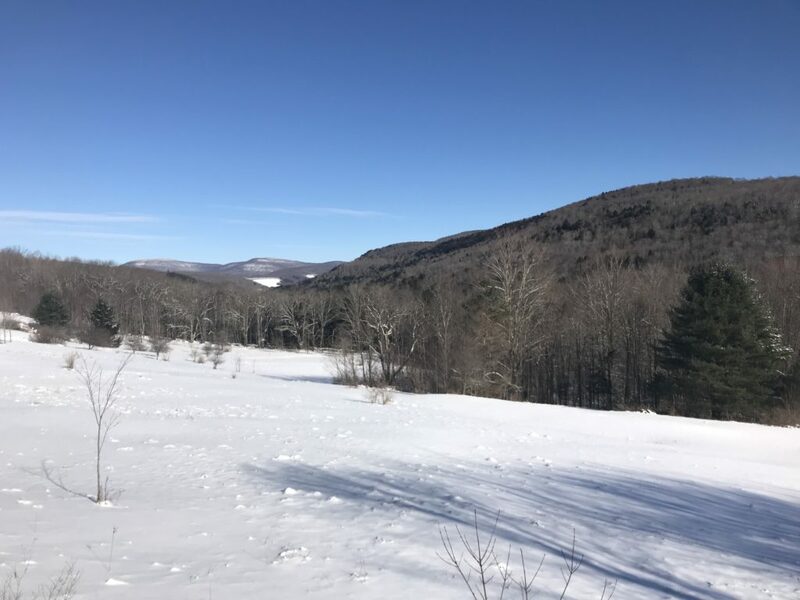 This entry was posted in Daily Catskills and tagged Catskills, Catskills NY, Upstate New York on February 17, 2019 by JNUrbanski. Soggy after yesterday’s all-day rain. Soaked trees, and fog burning off in the sun by early morning for a high of 50F. Humid. 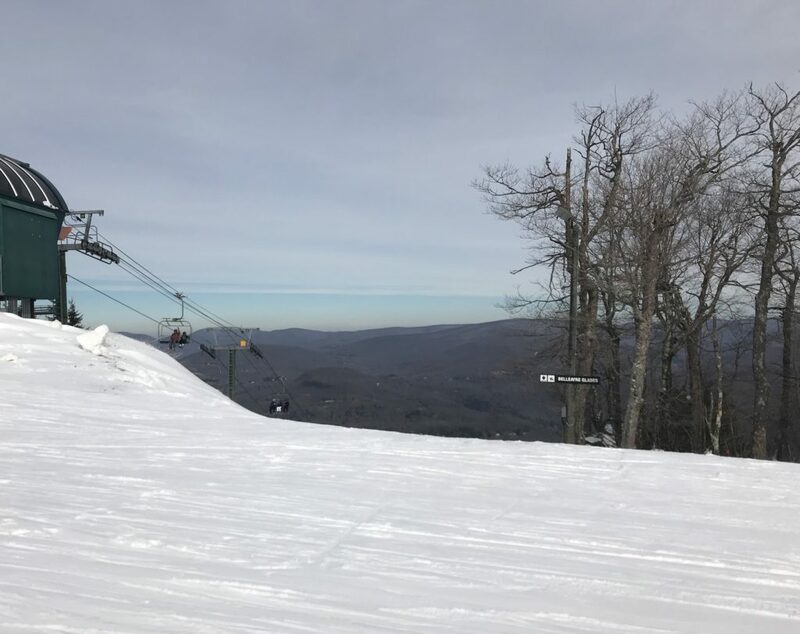 This entry was posted in Daily Catskills on February 7, 2019 by JNUrbanski. Hazy cloud burns off in the sun for a high of 49F and a light breeze. 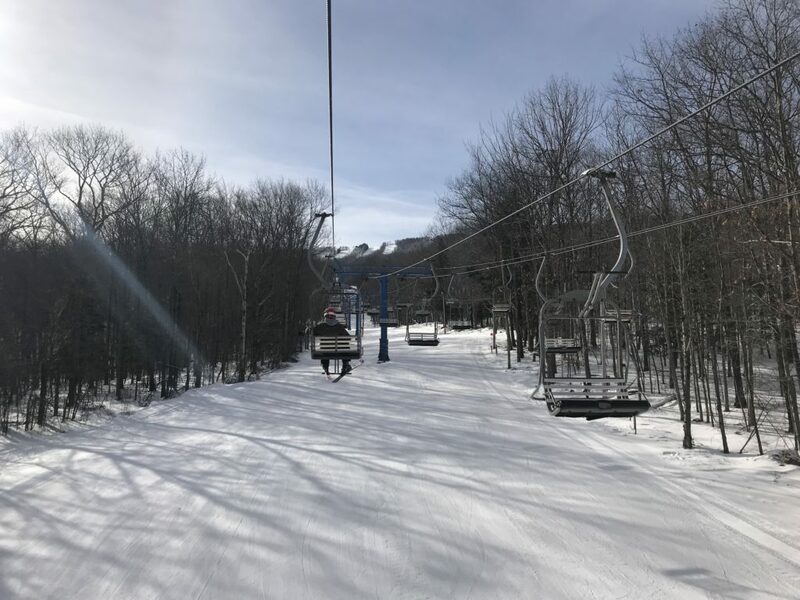 This entry was posted in Daily Catskills and tagged Catskills, Catskills NY, Daily Catskills, Upstate New York on February 4, 2019 by JNUrbanski. A balmy 26F at 8am with the sun rising through a jumble of clouds cluttering the baby blue sky. Thick patches of ice under last night’s light snow flurry. A high of 30F. This entry was posted in Daily Catskills on January 26, 2019 by JNUrbanski. After almost a week of gloom, the sun appears and lights up the sky to a dazzling, brilliant azure blue, a consolation for the laziest, slow rise in temperature: still a bone-chilling 12F. By afternoon, a haze had crept overhead like tight muslin, dampening the sun to a enigmatic glow. A breathtaking day. 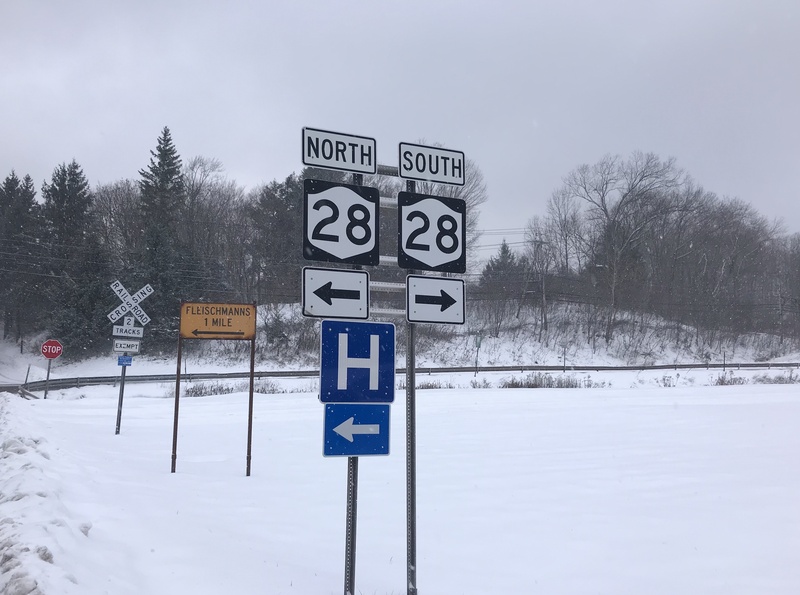 This entry was posted in Daily Catskills on January 22, 2019 by JNUrbanski. Overnight blustery winds deposit a foot or two of wet snow by morning. Temperatures warm up to 30F. A brief glimpse of the sun mid-afternoon and a plunge into low temperatures early evening. 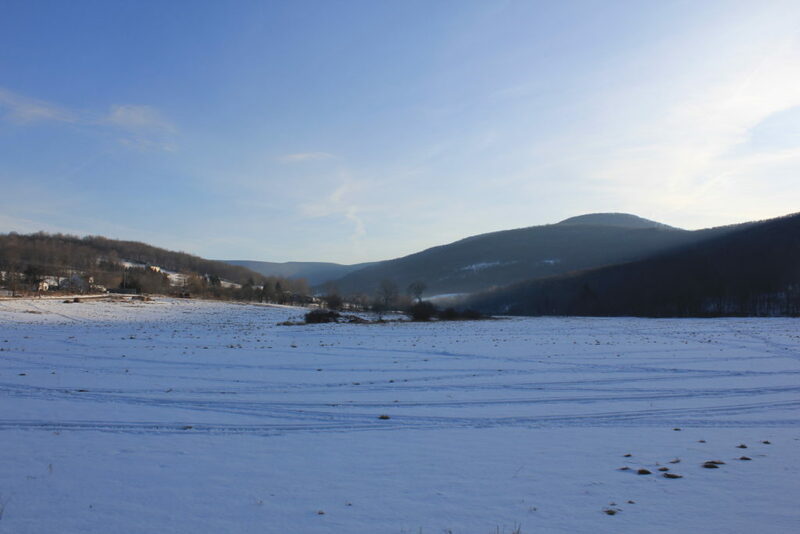 This entry was posted in Daily Catskills on January 20, 2019 by JNUrbanski. A little warmer with a high of 32F and humid with low-hanging cloud rolling over like grey smoke issuing light snow flurries. 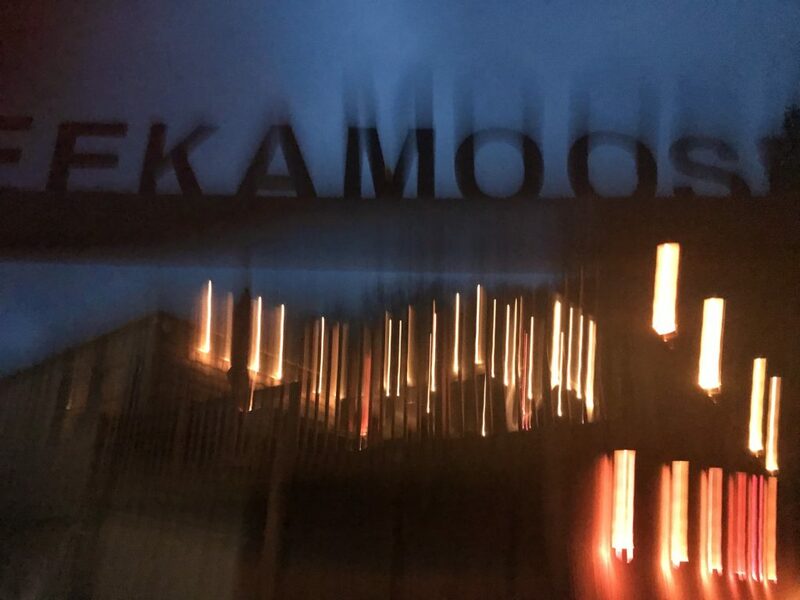 This entry was posted in Daily Catskills, Uncategorized on January 18, 2019 by JNUrbanski. Brisk and bright with a gauzy sky and a high of 28F. 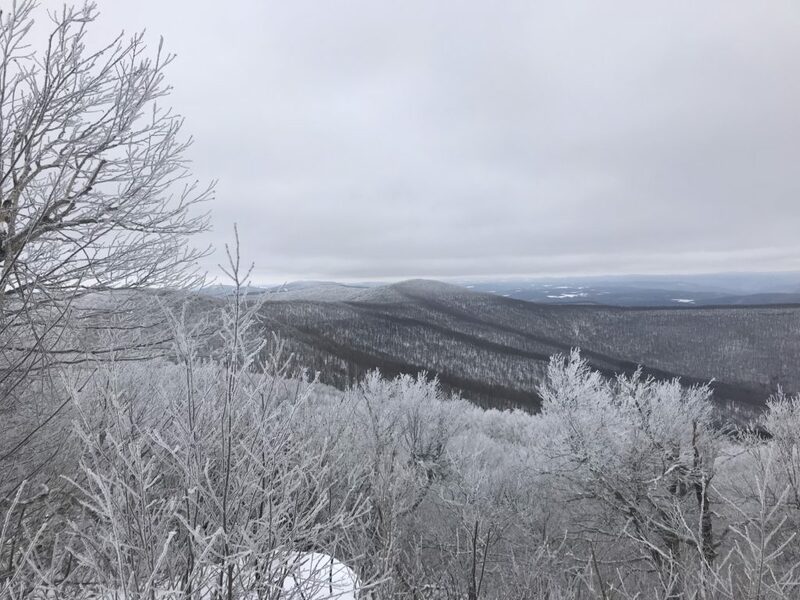 This entry was posted in Daily Catskills on January 17, 2019 by JNUrbanski. Back to the russet tones in the valleys with ice floes on the creeks conveying the frigid temperatures. Thick snow remains on the northern peaks. 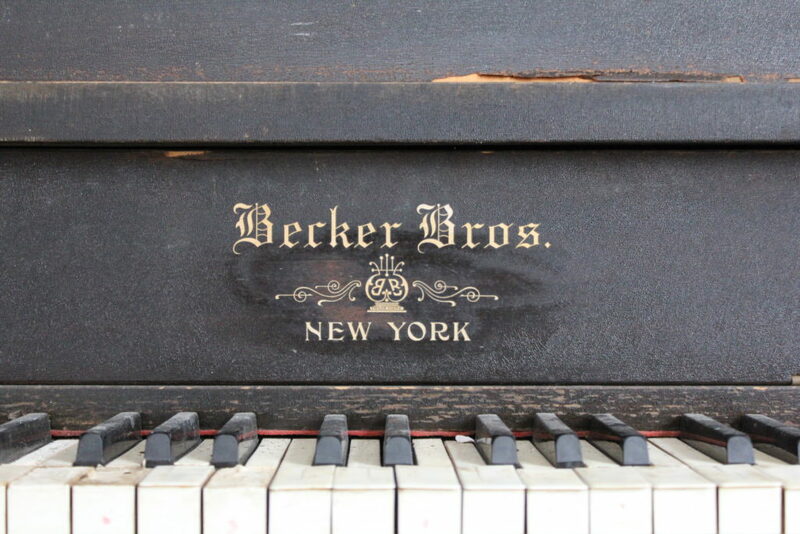 Overcast with a shimmering sky and a high of 26F. 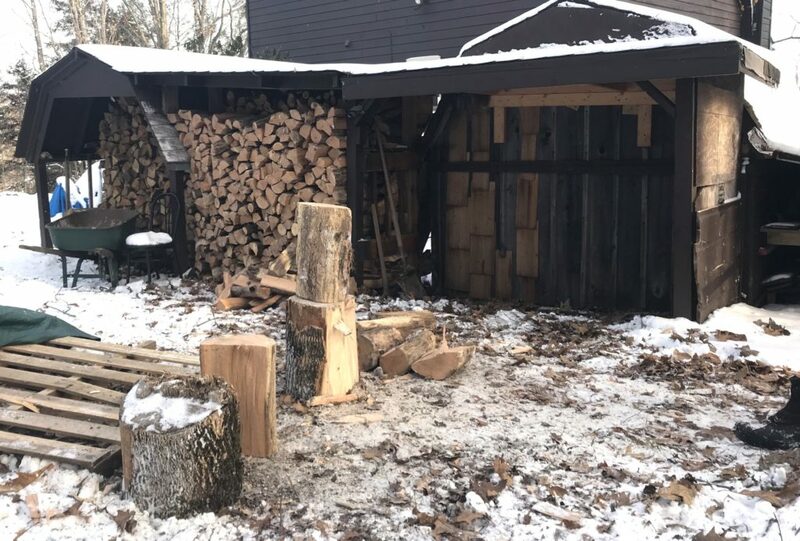 This entry was posted in Daily Catskills on January 15, 2019 by JNUrbanski. A crisp, bright day on the peaks. Cloudless skies and a high of 26F. Hazy valleys in the east under the afternoon sun. 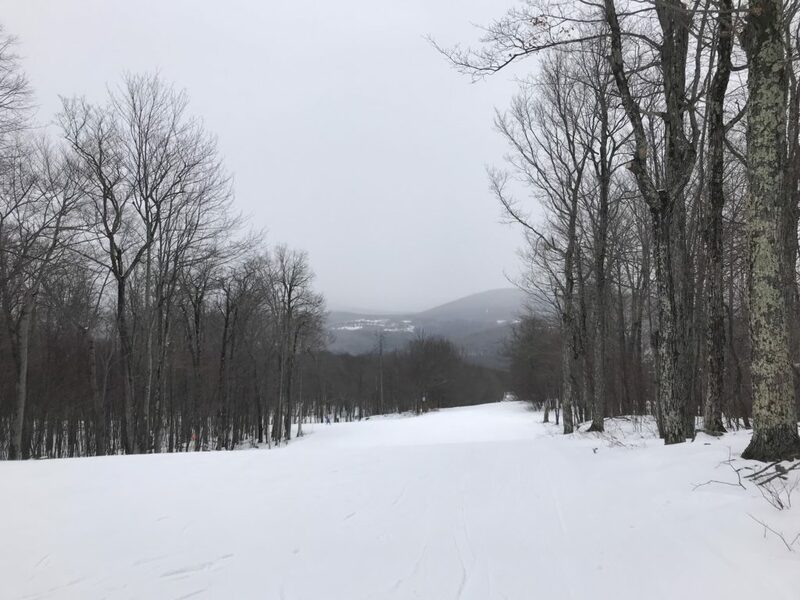 This entry was posted in Daily Catskills on January 14, 2019 by JNUrbanski. 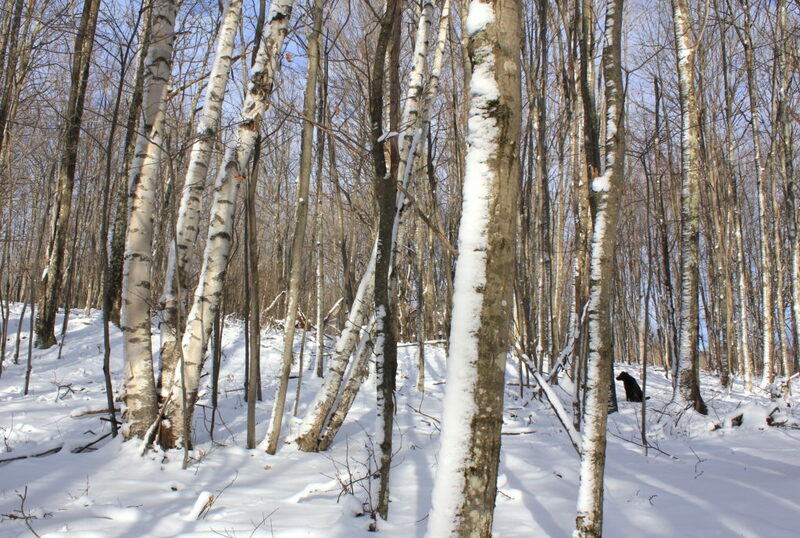 A high of 24F and partly overcast with periods of bright sunshine. A post-Christmas stint of wood gathering and chopping continues. 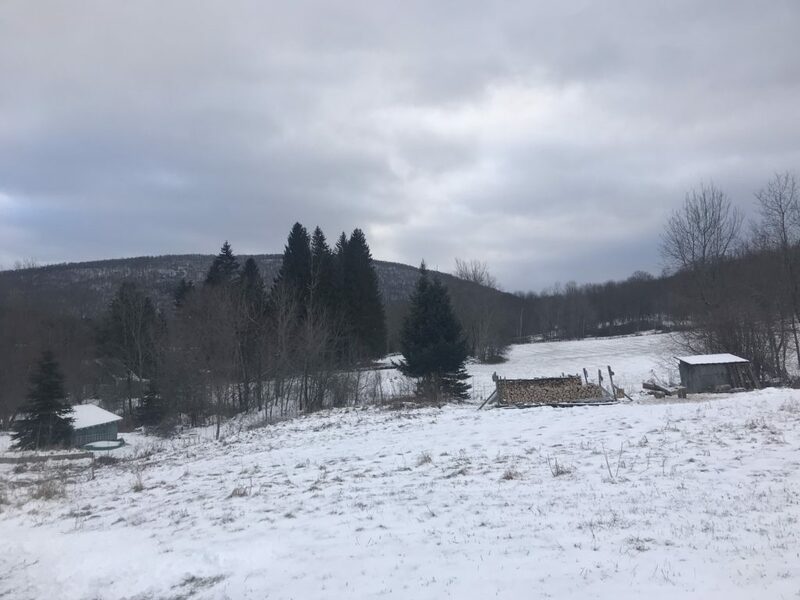 This entry was posted in Daily Catskills on January 13, 2019 by JNUrbanski. The big chill continues with a high of 25F and bright sunshine shining through thin stretch of rippled cloud looking like a fraying net curtain. A face-numbing afternoon that only a Black Lab could love. 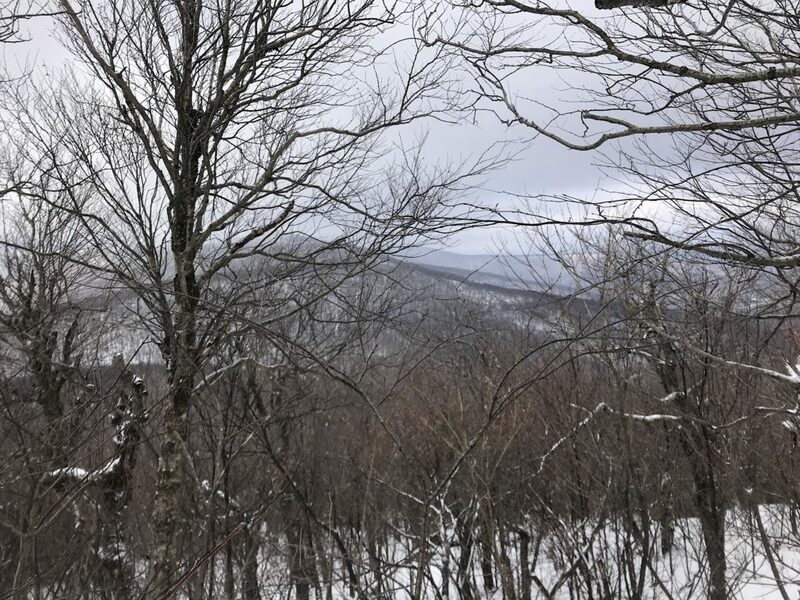 This entry was posted in Daily Catskills on January 12, 2019 by JNUrbanski. Brilliant sunshine, clear skies and bitterly cold with a high of 16F. After a foot of snow this week, a plunge into arctic temperatures. A muted sun glowing through a beautiful, milk glass sky. 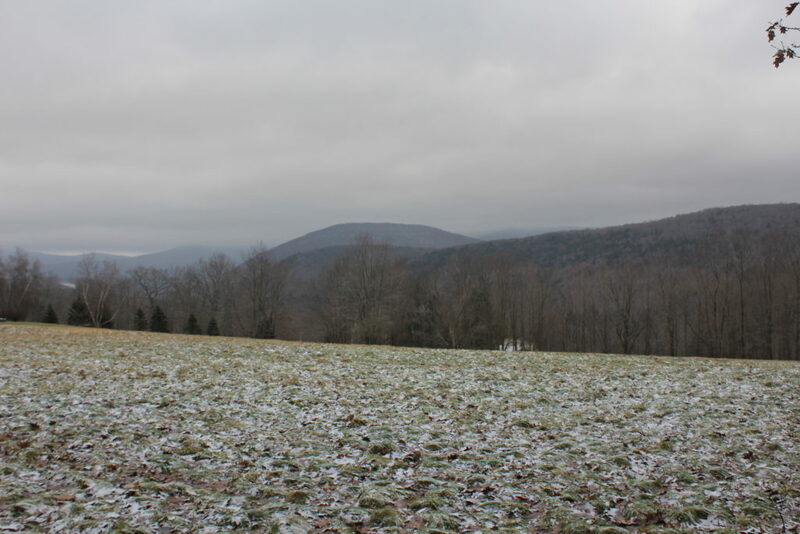 A high of 43F with snow only on the peaks by the end of the day. 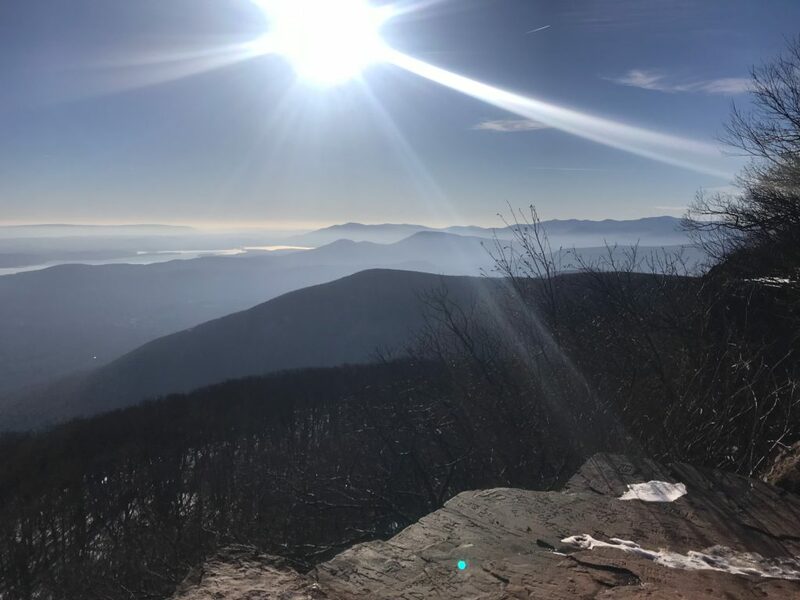 This entry was posted in Daily Catskills and tagged Belleayre Mountain, Catskills Hiking, Hiking the Catskills on January 4, 2019 by JNUrbanski. Dull, moody, overcast and a high of 35F. 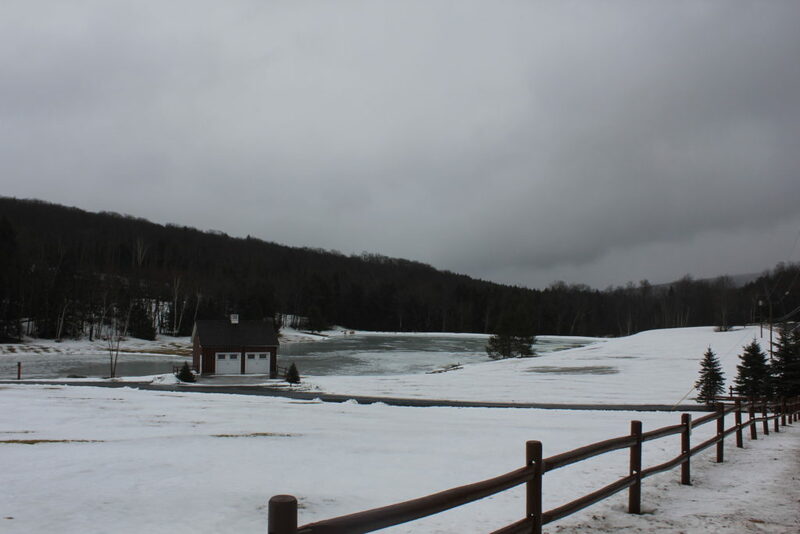 Much of yesterday’s snow melted with the rain before dusk. 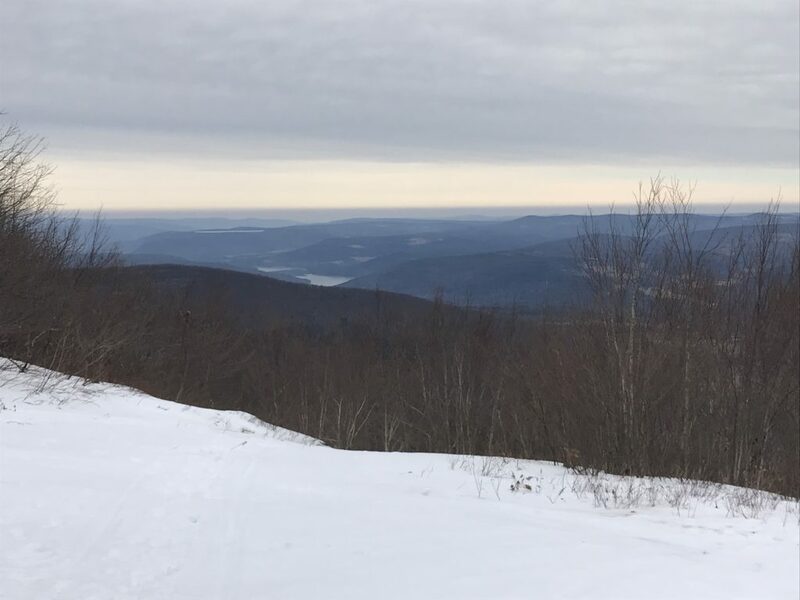 This entry was posted in Daily Catskills and tagged Catskills, Catskills Hiking, Catskills Writer, Upstate New York on December 31, 2018 by JNUrbanski. A overnight layer of powdery snow, sticking to trees and structures, turns the brown valleys white again and dusts the icy peaks. Streaks of smoky blue cloud ripple through the sky. A high of 32F. 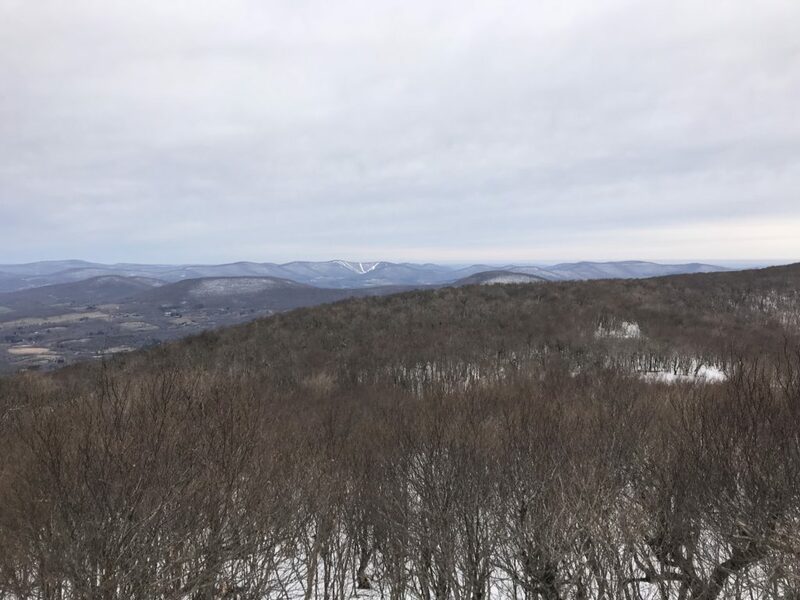 This entry was posted in Daily Catskills and tagged Catskills Hiking, Daily Catskills, Hiking the Catskills, Winter Wonderland on December 30, 2018 by JNUrbanski. 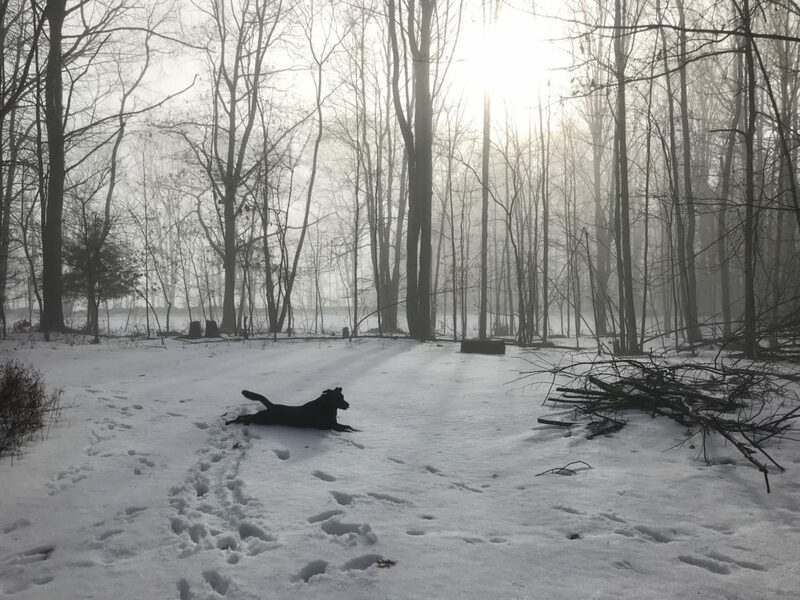 Above is the most popular Daily Catskills image of the year, a picture of our Black Lab Alfie, who regularly gets a 60% engagement rate on his own, modest Instagram account. 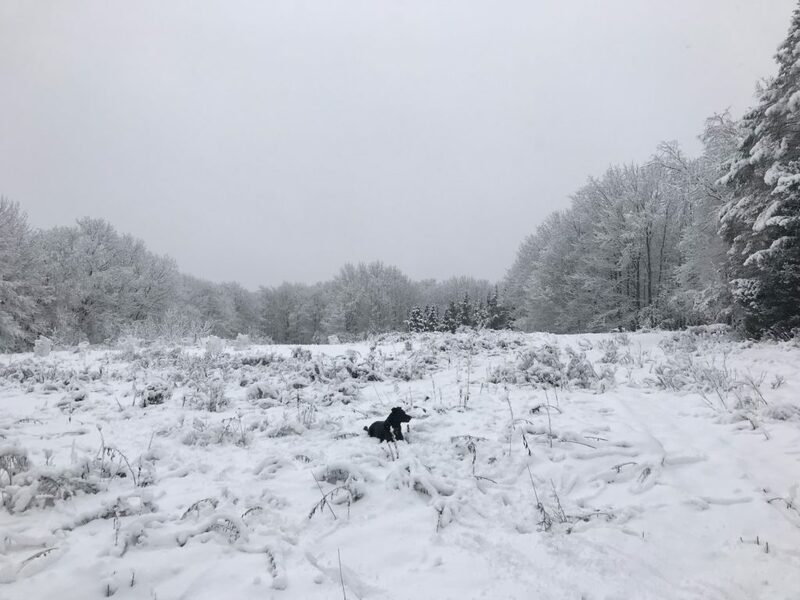 Videos on Instagram of Alfie in his element – snow – regularly get many hundreds of likes on our own social media. 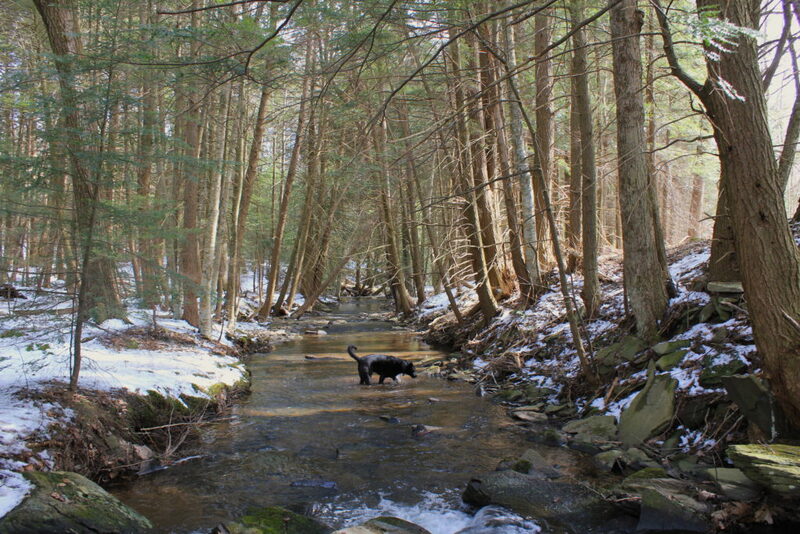 We adopted Alfie from the ASPCA in Kingston in 2014 and we began hiking the Catskills 3500 just to wear him out. He’s had his portrait taken by NYC photographer Shannon Greer and we wrote a post here about him that was so popular it was picked up in New York City by Mrs Sizzle. I’ll be writing Part 2 of Alfie’s life in the New Year. 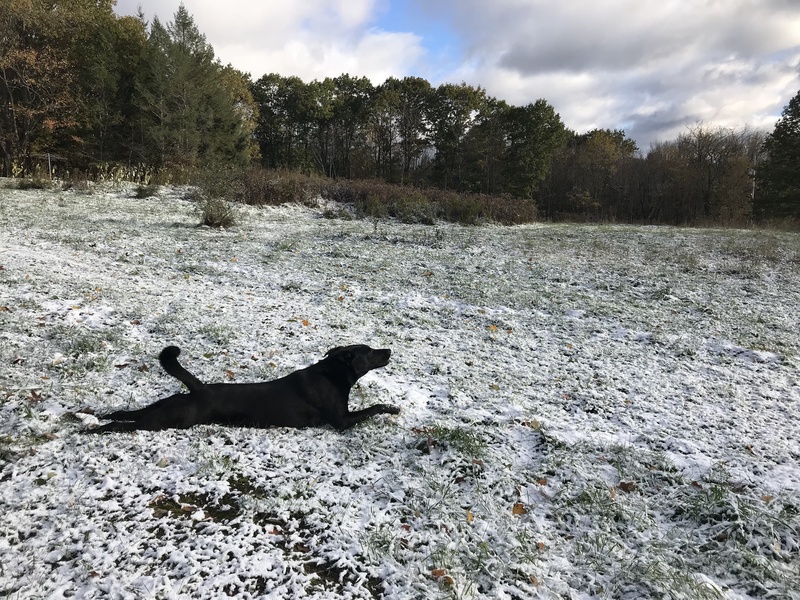 He loves snow and swimming regardless of temperature because he has a thick layer of furry Labrador blubber and webbed feet. He loves hiking and turns six years old in April. If I could take him skiing, I would. 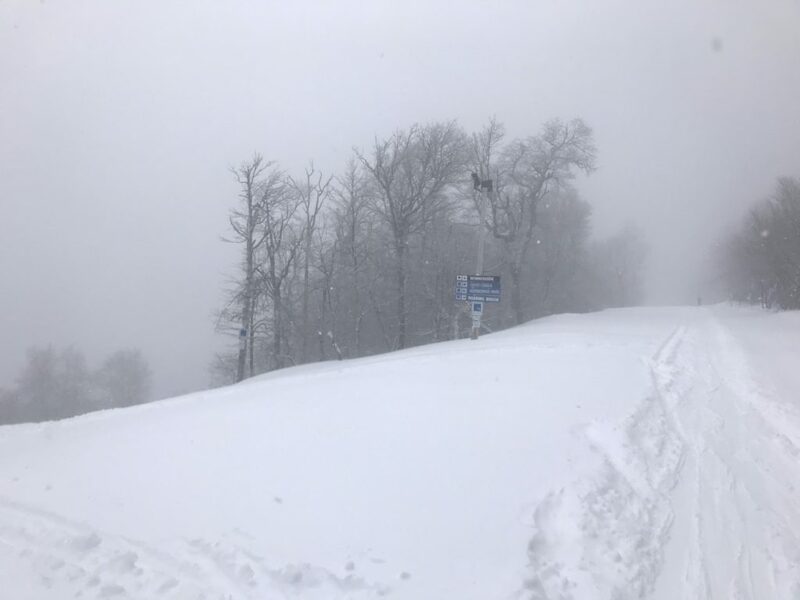 There’s a chance you will find us snow-shoeing the hiking trail from Giggle Hollow to the top of Belleayre Mountain this winter to catch a glimpse of the skiers flying down Cathedral Run. 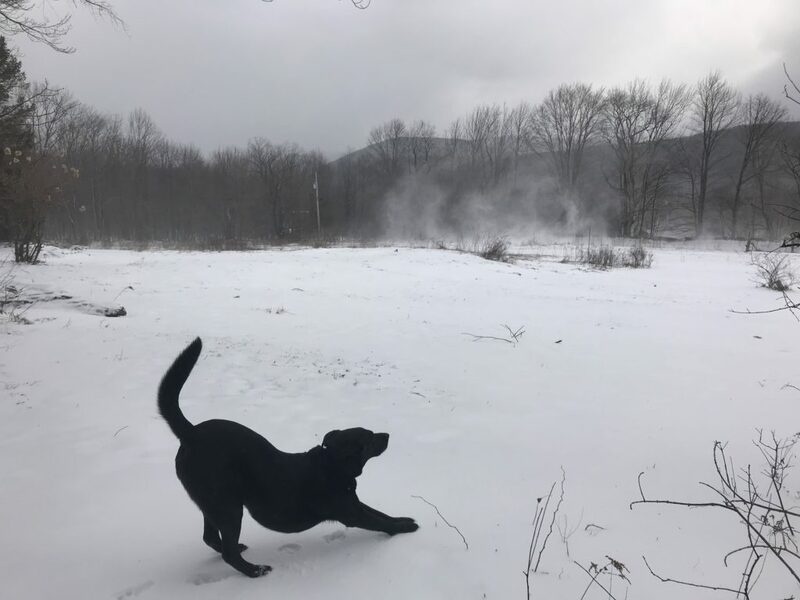 Alfie appreciates his country life here in the Catskills and is such a good dog, he gets fresh, warm marrow bones straight out of the oven. I sometimes think he’s the only reason that we have readers at all. 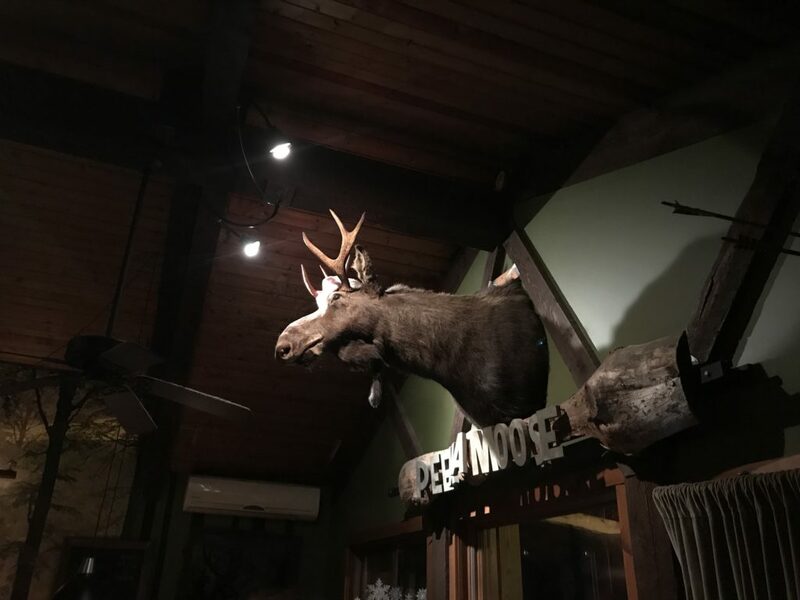 This entry was posted in Daily Catskills on December 28, 2018 by JNUrbanski. Overcast and frigid. 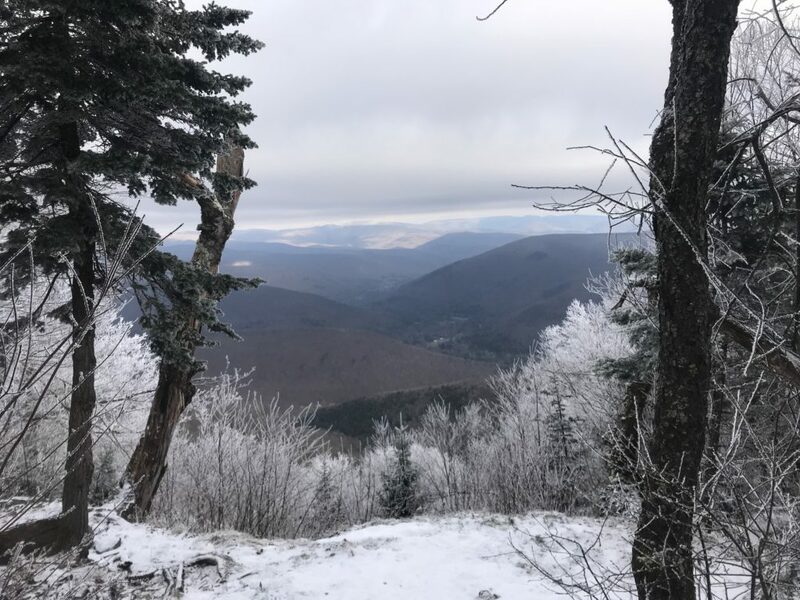 A high of 32F with only the lush, fir-capped peaks harboring pockets of winter wonderland at their summits. 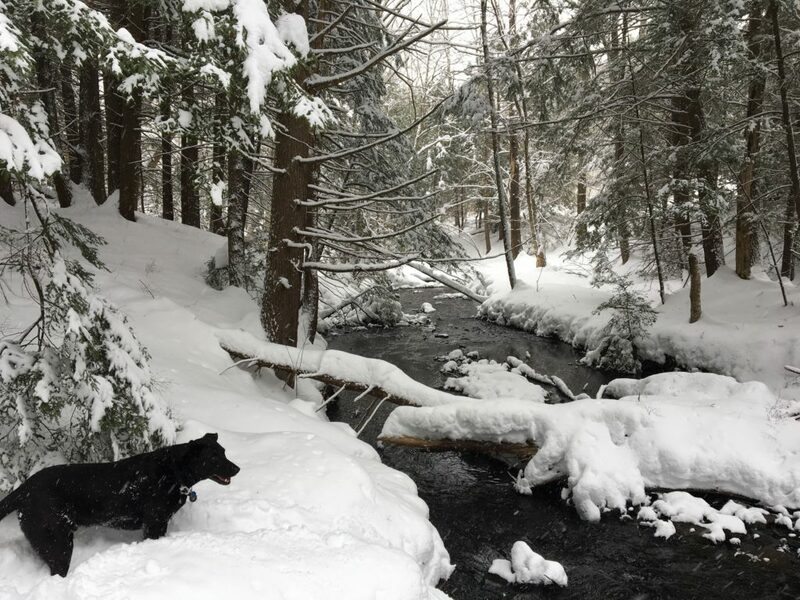 Snowmelt rushes through strong, high creeks and rivers. 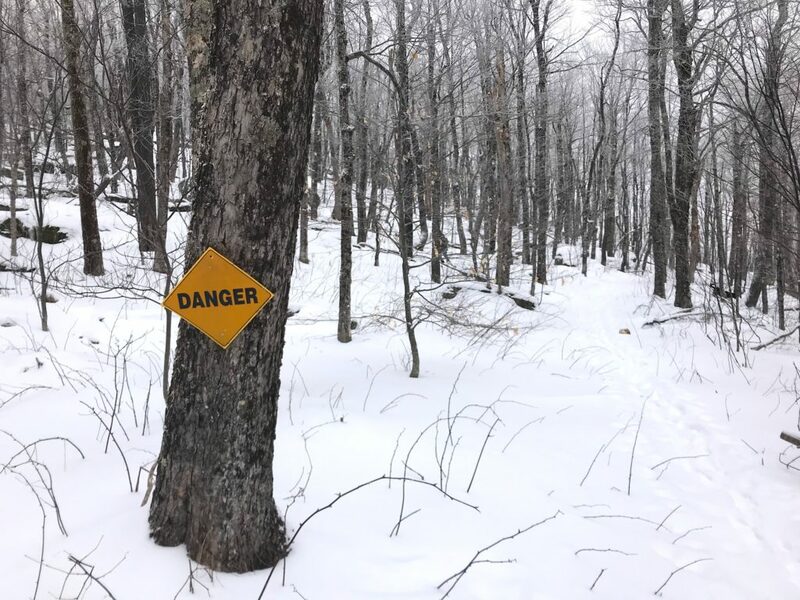 This entry was posted in Daily Catskills and tagged Catskills, Catskills Hiking, Daily Catskills, New York, Yule in the Catskills on December 23, 2018 by JNUrbanski. After a stormy night with house-battering rain, an overcast morning. Gusty and dull with a high of 32F. More evening snow. 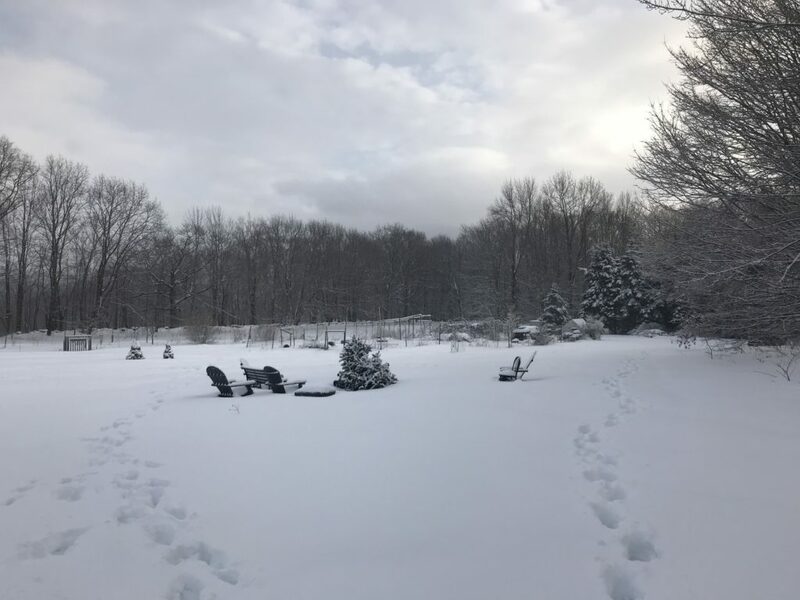 This entry was posted in Daily Catskills and tagged Catskills, Catskills Writer, Daily Catskills, Upstate Dispatch on December 23, 2018 by JNUrbanski. Today, December 21st, is Winter Solstice, officially the first day of winter. The northern hemisphere of the earth is pointed the farthest away from the sun and, tonight begins its slow return towards it until the June Solstice of 2019. The ancient tradition of Yuletide, one of the oldest winter celebrations in Europe began this morning and will end on January 1st, 2019. Yuletide was a fire festival celebrated by the Northern Europeans. Pre-Zoroastrian Persians and ancient Romans, who celebrated something similar before the common era. Diwali is another festival of lights that begins earlier in the year. Basically any community in the dark, forbidding northern hemisphere, on this shortest day of the year, celebrated fire. 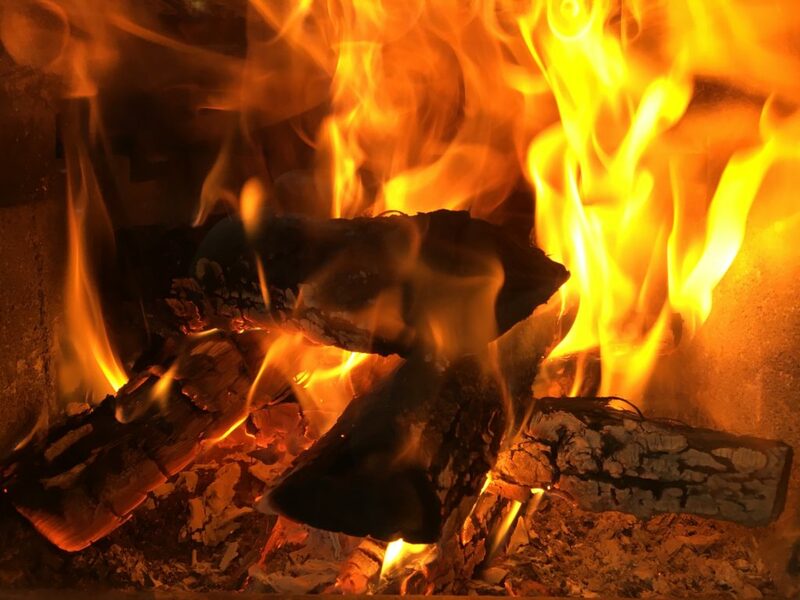 The most enduring British tradition from Yuletide is the Yule Log, a small firestarter from a larger bonfire that was shared with many households by landowners in England. 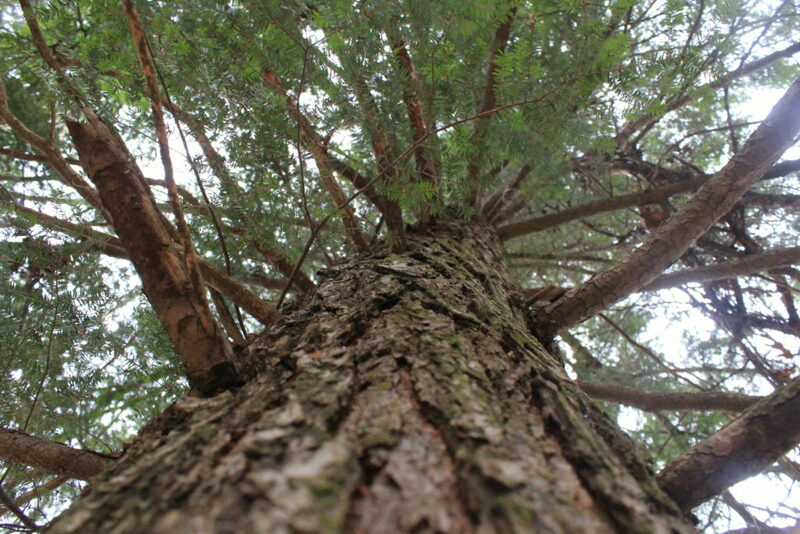 Evergreen trees were fashioned into wreaths and other decorations for the interior of the house for their refreshing smell. The Brits still make cakes fashioned into Yule logs and, of course, we still bring in fir or pine trees, decorate them with lights. Happy Solstice! 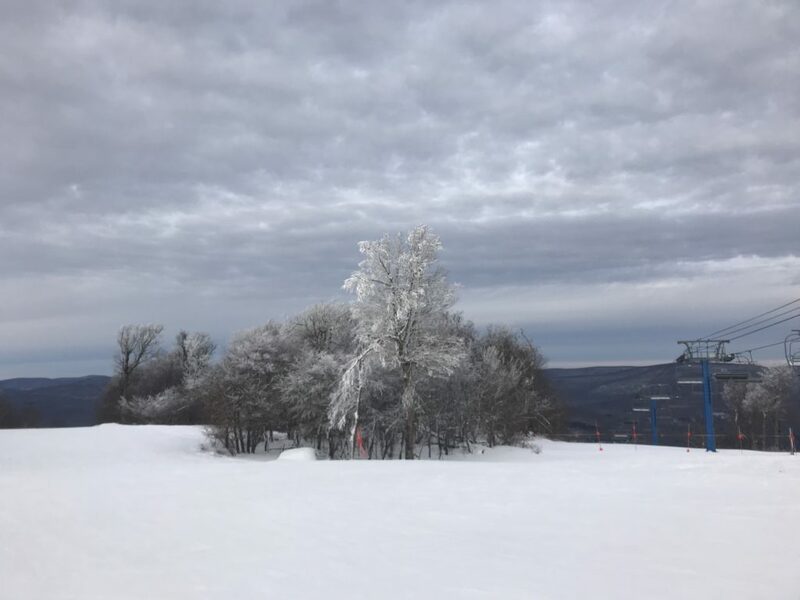 This entry was posted in Daily Catskills and tagged Catskills Christmas, Have a Cool Yule, Yule in the Catskills on December 21, 2018 by JNUrbanski. Still gloomy with the elusive sun covered by fog on the peaks and a high of 36F. Another week of monochromatic moodiness enlivened only by local, sparkling cider. 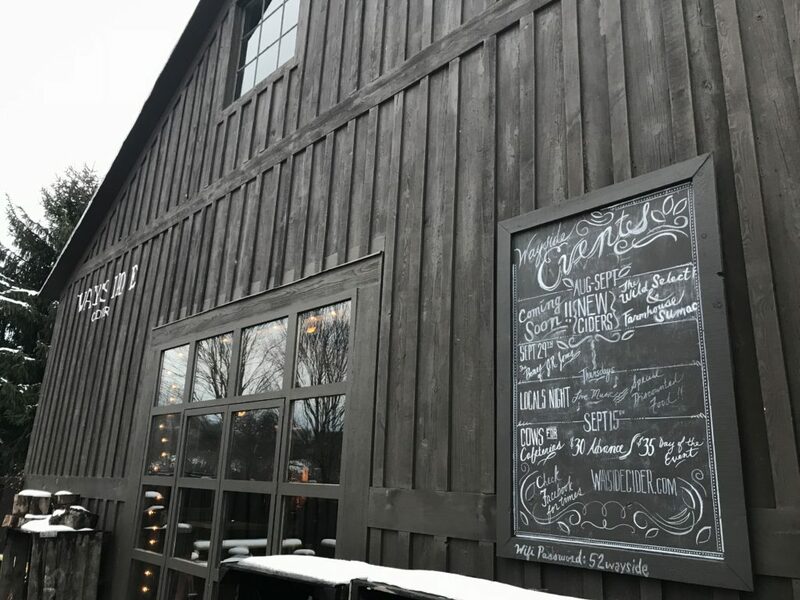 This entry was posted in Daily Catskills and tagged Booze, Catskills, Catskills Booze, Daily Catskills, Wayside Cider on December 1, 2018 by JNUrbanski. Gloomy and dark, with a bitter chill. Enigmatic fog on the peaks with the odd flurry, a shimmering sky and a high of 36F. 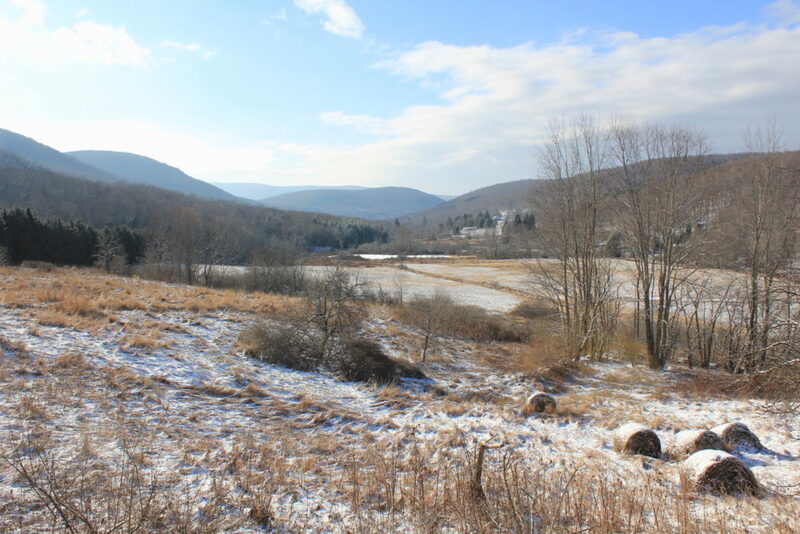 This entry was posted in Daily Catskills and tagged Catskill Mountains, Daily Catskills, Upstate, Upstate Dispatch on November 30, 2018 by JNUrbanski. A quiet dawn breaks over a winter wonderland and a thick blanket of wet snow. 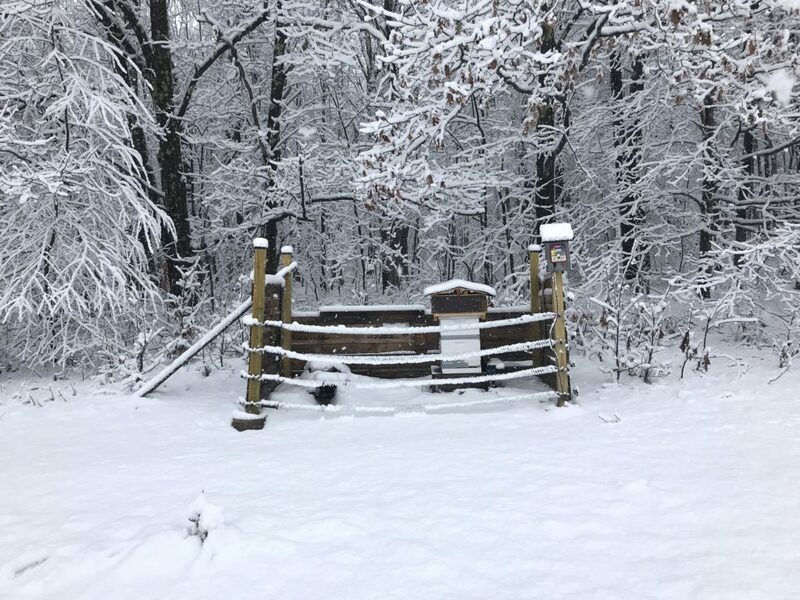 More snow flurries throughout the day and a high of 36F. 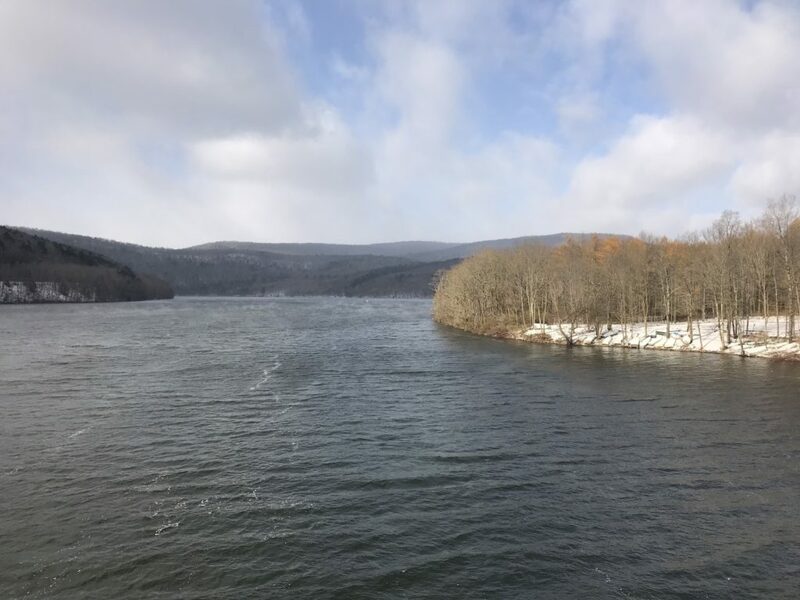 This entry was posted in Daily Catskills on November 27, 2018 by JNUrbanski. 5F at dawn, rising to 19F by 1.30pm. Bone-numbingly cold with an arctic breeze making waves on the steaming Pepacton Reservoir. Ethereal clouds. Update: a plunge into the single digits overnight for a low of -2F or lower on the peaks. 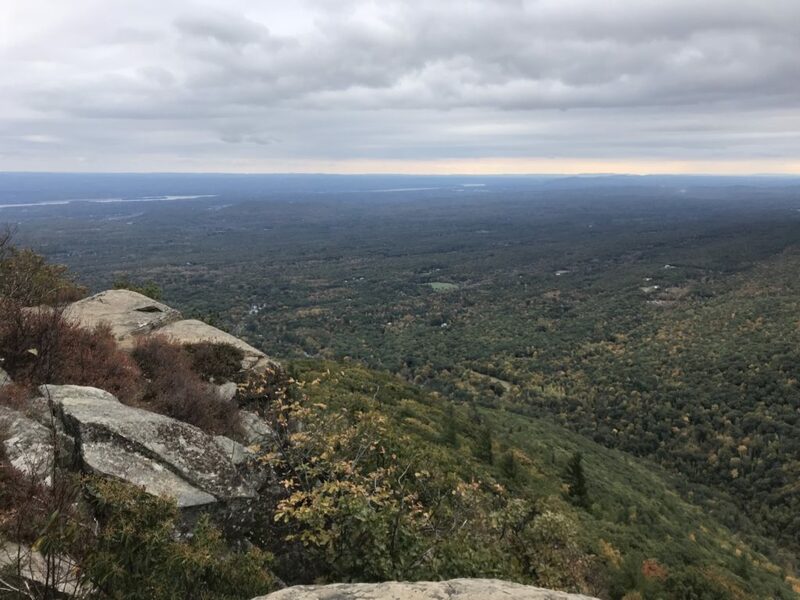 This entry was posted in Daily Catskills and tagged Catskill Mountains, Catskills, Catskills Writer, I love NY, Visit Catskills on November 22, 2018 by JNUrbanski. 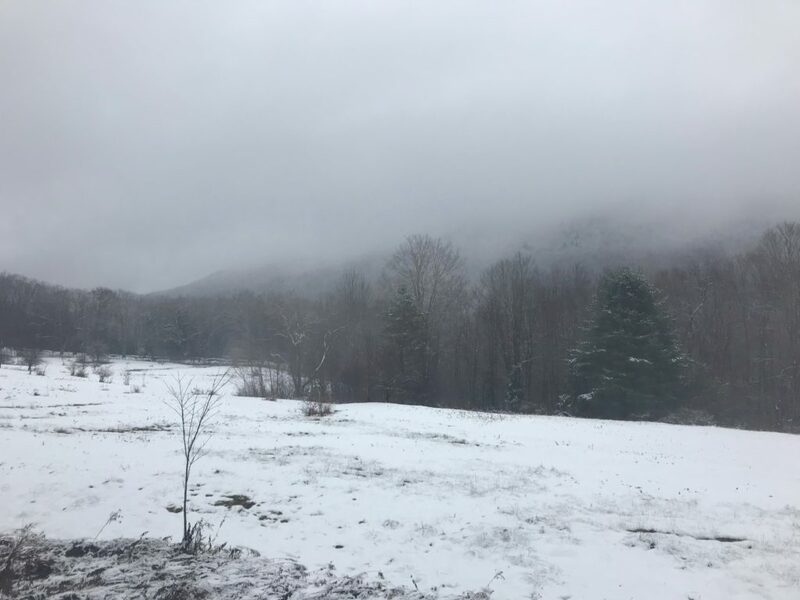 A high of 34F and overcast with the mountains blanketed in thick fog. An afternoon storm blows through bringing a few inches of snow. Snow-making continues on Belleayre. 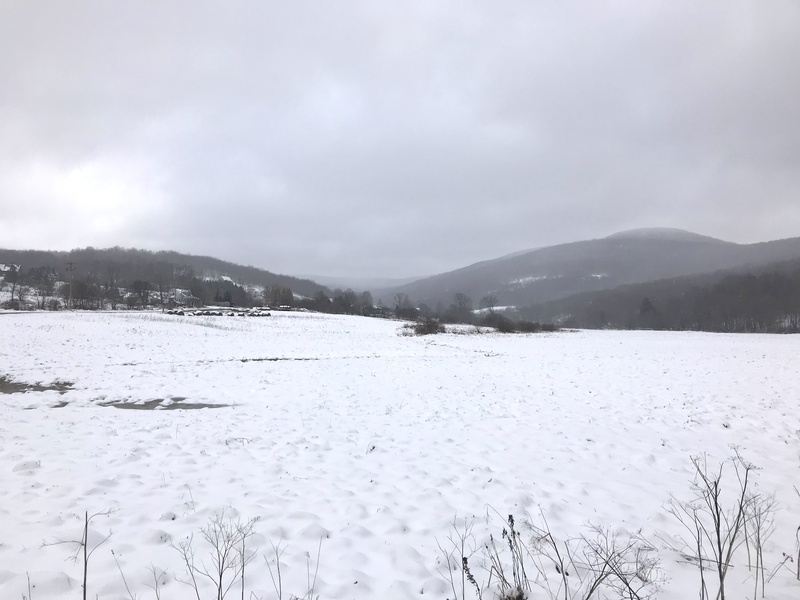 This entry was posted in Daily Catskills and tagged Belleayre Mountain, Catskill Mountains, Catskills, Catskills Writer, Snow in the Catskills on November 21, 2018 by JNUrbanski. Thick snow blankets the landscape that’s shrouded in mysterious mist. 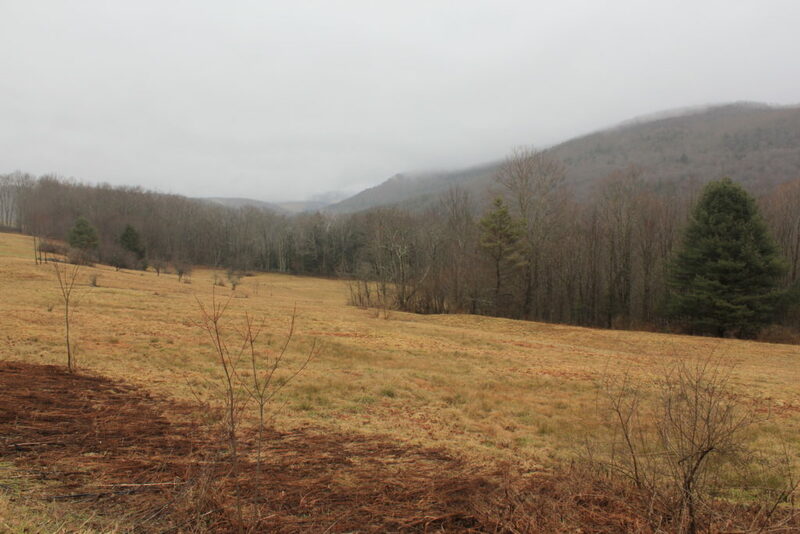 37F by 2pm, but humid and foggy on the peaks with a sprinkle of afternoon rain. 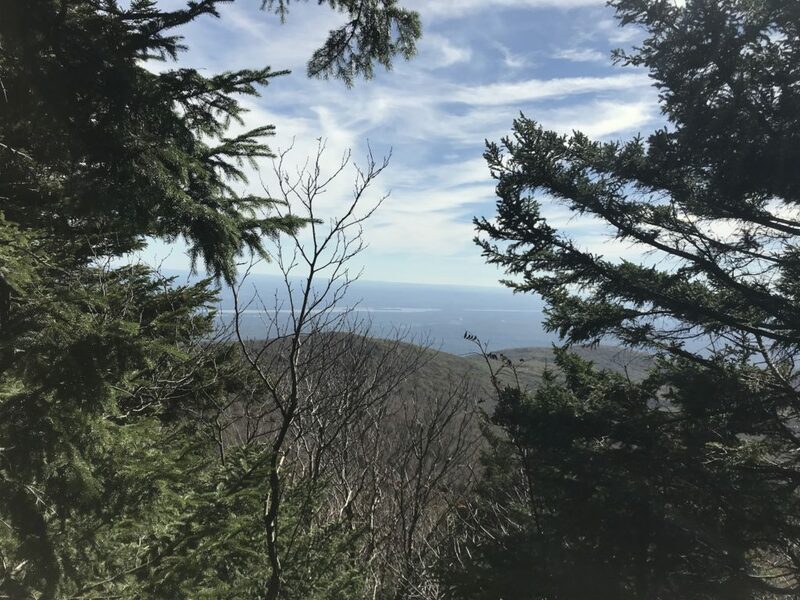 This entry was posted in Daily Catskills and tagged Catskill Mountains, Catskills, Catskills Writer, Daily Catskills on November 20, 2018 by JNUrbanski. An overcast morning with thick cloud like a comforter rolling back mid-morning in places further east, like Woodstock, where the foliage is a bit more colorful. Scattered showers with a strong breeze making waves. A high of 48F. 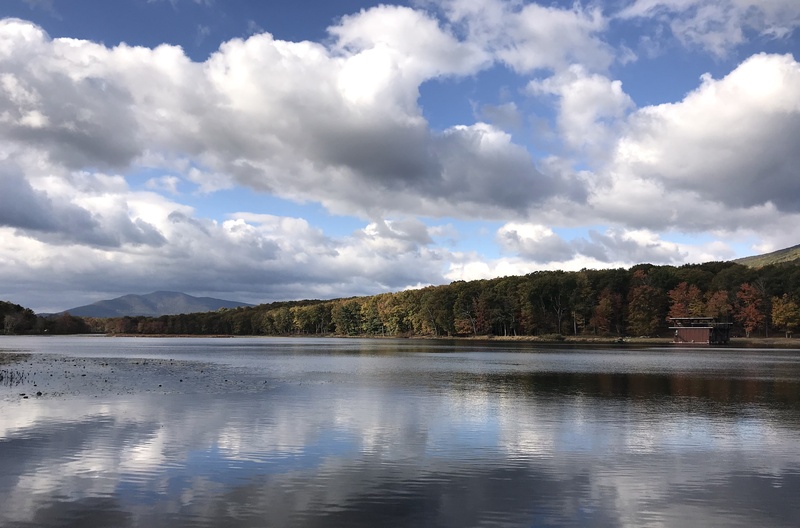 This entry was posted in Daily Catskills on October 25, 2018 by JNUrbanski.